The Foodshare Mobile Food Truck is pictured before opening at its bi-weekly station behind the West Suffield Congregational Church. 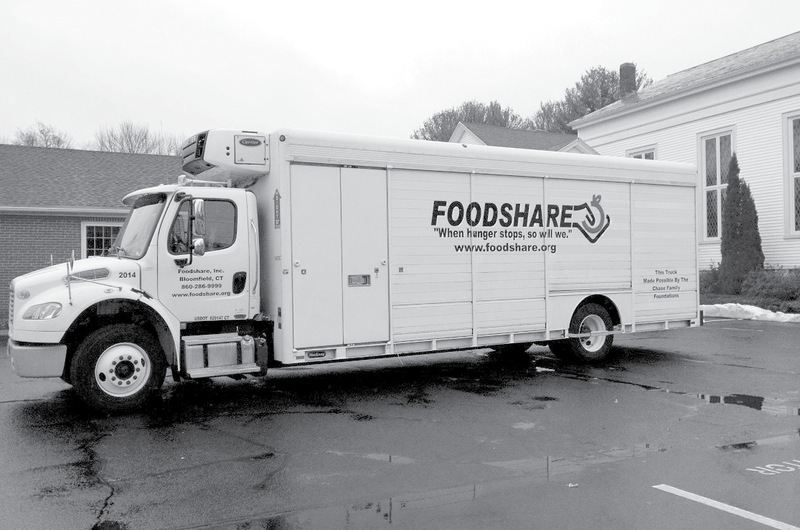 For the past six years, in addition to operating the Crossroads Food Pantry, the West Suffield Congregational Church has partnered with Foodshare to offer a town site to hold a Mobile Food Truck. The food truck is a pantry-on-wheels for people who are in need of food assistance and visits towns in Hartford and Tolland Counties. Food choices vary from week to week but usually include several types of fresh produce. Our Mobile site is restricted to people living in the state of Connecticut. Founded in 1982, Foodshare is the regional food bank serving Connecticut’s Hartford and Tolland counties, where 121,000 people struggle with hunger. Foodshare is a member of the national organization Feeding America. Hunger exists in every single one of the towns and cities in Hartford and Tolland counties, and Suffield is no exception. The truck is at WSCC every other Tuesday from 1:45 p.m. – 2:15 p.m. The Foodshare truck schedule can be found by calling 211 directory, text “Foodshare” to 85511, or by visiting the Foodshare website.